JACK: apps can be connected in any way you like. You wait ages for one iOS inter-app audio routing platform to come along, and then two arrive within months of each other. Following the successful roll-out of Audiobus, Christian Schoenebeck has released the JACK Audio Connection kit for iPhone and iPad. Already available for desktop platforms, JACK "allows audio channels and MIDI ports of your audio and music apps to be connected with each other". Connections are made on a visual interface - you can hook things up however you like. Other features include record/playback synchronization between DAWs and sequencer apps, multi-core CPU support and the promise of low-latency performance. JACK is an open standard, which means that any app developers can just go ahead and add support for it (it allegedly takes less than an hour to implement). 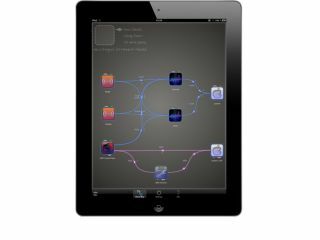 Interestingly, we've also just got word that the Audiobus SDK has now been made public as well, giving developers plenty of choice when it comes to adding routing options to their apps. One other piece of good news - JACK is free and available now on the Apple App Store. We don't yet know of any apps that support it, but we'll keep you posted.